Today's interview is with Christi Johnson and it's an emotional one with tears and all. Christi joined Consulting accelerator in November 2017 and in four short months she became a different person and revolutionized her copywriting business. Christi's story is incredible -- After a messy divorce she was homeless and had to survive as a single mother with no confidence in her own ability. She turned to copywriting and taught herself everything. Within a few months she had paying clients and within two years she was making six figures. Although Christi had clients, she was still living in the dark with a head full of destructive thoughts that were throttling her success. 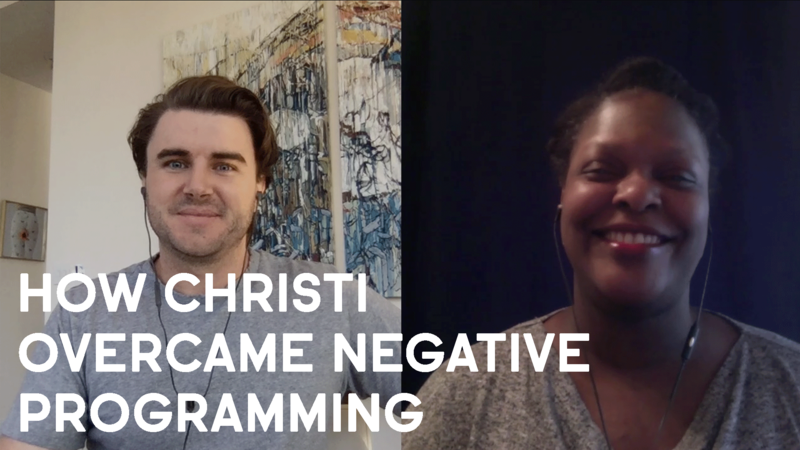 The mindset training in the program helped Christi rewire her brain and become a completely different person. Christi is now able to control her own fate and make whatever income level she wants because she believes in her own ability and she can finally see the big picture of how she helps businesses instead of just writing words. How to go from an "hourly mindset" thinking you're worth $15 /hour to a "value mindset"
We explain all of these in detail in the video -- make sure you watch it in full because theres a lot of gold nuggets you don't want to miss! If you're interested in having a transformation like Christi did -- Check out this free webinar which shows you how she did it. If you're interested in learning more about Christi's copywriting business or hiring her -- Check out her website here. Sam Ovens & The Consulting.com Team! Sam Ovens:	All right, welcome, everyone. It's Sam Ovens here, and today I've got Christi Johnson, one of our students and customers of Consulting Accelerator. Christi's got an awesome story, and she joined Accelerator when she was already making six figures and she had her own copywriting business where she was writing copy for clients. While she was making money, her big fear was that she didn't have a predictable way to go out and get more customers if she wanted to. Her business was built on referrals and doing good work for people, but if any of those clients dropped off, she didn't have a way to replace them, and she didn't really have a lever to pull on to really take her business up, and really create a predictable machine to grow it and make whatever income she wanted. Through Accelerator, she's been able to do that, as well as a lot of other breakthroughs. No one can tell you Christi's story better than her, so today I'm going to be asking her some questions and learning about the process that she's been through, and her story, and all of that. How's it going, Christi? Christi Johnson:	It's going very well. Sam Ovens:	Awesome. Christi Johnson:	Glad to be here. Sam Ovens:	Why don't we start out with how you found Consulting Accelerator? Christi Johnson:	Wow, I think it was a Facebook ad, or did I see you around the internet? I don't know. You were everywhere for a little while. Sam Ovens:	Probably a Facebook ad. Christi Johnson:	Okay. Sam Ovens:	Cool. Then what made you interested in joining? Christi Johnson:	Well, my business was going pretty well, like you shared, but in the back of my mind I was always afraid that I would lose a client for one reason or another. Businesses might not produce as well as they want, so they might not be able to afford that luxury of having a copywriter. I'm a single parent. I have one daughter. She lives in New York City, and I'm basically supporting her as she's pursuing her dreams. She's college-aged, and I was terrified I would lose a client, and so I said, "Okay, let me go through Consulting." I think I went through the webinar twice, and it just made sense, so I went on and purchased it, just because I know that what I do is consulting-ish, even though I'm providing a service. There's a bit more than just copywriting that I understand, and I do grasp some fairly high-level concepts in marketing, so I figured, "I think I can provide more value to people. I just don't know how to go after them. I don't even know what to say when I get them on the phone." That's pretty much it. Sam Ovens:	Cool. When did you join? Christi Johnson:	I joined October, November of 2017. Sam Ovens:	Cool. Why don't you tell us your experience, and your transformation, and how the program's helped you? What was the story of how that happened? Christi Johnson:	Sure. When I first joined, I went through week one, and that was awesome. I went through week two, which is the mindset, and that was a tearjerker for me, because I did not believe in myself. I had serious mindset issues. I'd be referred a client, and then whatever they pitched to me as what they were willing to pay is what I would accept, and it was a revelation to me to know that I could value my work. I could look at it and say, "Okay, this is actually worth this per month. If you're going to retain me, that's what you're going to have to pay, period." Yeah, sure enough. Then I went through the sales training as well. Sure enough, I lost client not that long ago, and I was able to use your training to call somebody that I had worked with previously, and I didn't even know what had gone on in her business, but I called her and in one phone call used a version of your script, my version of your script, and I closed her in one phone call. What in the world? I didn't miss a paycheck. I am not going to cry. Oh gosh, I'm so emotional, but anyway, I didn't miss a paycheck, and where I had gone down below six figures in one week, I went right back to six figures simply because of your training. Sam Ovens:	Got it. Christi Johnson:	Yeah. Sam Ovens:	Why do you think ... You said that whatever the client said or the prospect said that they were willing to pay, that's what you would accept. How did that belief change for you? Christi Johnson:	Well, there were some things that I didn't really understand about the marketplace, in terms of copywriting, and there were also some things I didn't understand about my own skill set, the value that I was bringing to the table. I thought I was just providing a service, and I knew I was making my clients money, but I just didn't know how valuable it was. There's more than money that I provide. I also provide peace of mind, and I provide a little bit more time freedom for the client. I was able to distill what I do and say, "No, this is actually ... If I work part-time, this is worth 3, 4, 5,000 dollars per month for you." I didn't think that way before, and I didn't know how to just go in and say, "This is what I'm worth. This is what my part-time retainer is worth, this is what a full-time retainer is worth." If they can't pay it, then that's fine, but I didn't know that I could just go in and, for lack of a better term, demand what I want. I didn't think that ... [crosstalk 00:05:57] Sam Ovens:	Because I think at one stage, like in Holly wood and stuff, they would get paid a cent a word or something. Christi Johnson:	I think some still do, especially if they're proofreaders. Sam Ovens:	Yeah. Christi Johnson:	I know a lot of proofreaders, and they do a cent a word, or a $1.75 a word. Sam Ovens:	It was like looking at ... Is that how you used to think, thinking that you're just getting paid to write words instead of what the words do for the business? Christi Johnson:	Yes, exactly. Yeah, I still had an hourly mindset. I was like, "Yeah, I'm probably worth 15 dollars an hour, 20 dollars an hour. How do I back that out into maybe a dollar amount per email instead of a project base?" I look at projects now, and I understand that one piece does not work without the other, and I'm the one who ties all that stuff together. A really good copywriter doesn't just understand writing. They understand psychology, they understand marketing, they're good people people, they can put their client at ease, and they come on as a value added consultant, and I did not get that before. I get it now. I get it now. Sam Ovens:	How did the program help you understand that? Christi Johnson:	Well, there's an old me. I used to stay up really, really late. You would never find me on a call at 9:00 in the morning. I was burning the candle at both ends. Then there was a person that I wanted to be, and the week two training helped me to understand that I was basically holding myself back. There's a light side of us, there's a dark side of us. I was basically living in the dark. Your training is incredible. You can't see my desk back there, but I have little stickers. I printed out things that you've written, and they're on my wall so I can look up at them every single day. I've got the right mindset now to build an actual business, and not only that. I think I can teach people how to do what I've done. I've always had this dream to help other women who've been in a funky position to be able to create income for themselves, because that's why I came into copywriting in the first place. I went through a horrific divorce, and overnight, I mean literally overnight, my daughter and I didn't have anywhere to live. We didn't have food on the table, and copywriting is what took me out of that, but your courses helped me to just see what the possibilities are. I didn't really know what the possibilities were before. Sam Ovens:	Got it. You said there was an old you and a new you. Christi Johnson:	Yeah. Sam Ovens:	Describe the old you. Christi Johnson:	Clearly, I'm African American. I'm a black girl. The old me fell into this narrative of ... I don't even know why this is, because my father's a physician, so we grew up with money. We grew up pretty comfortably, but I still ... I was ashamed of money, because we didn't have friends growing up. We lived on the white side of town. All the black kids hated us growing up. We were the anomalies. All my friends were white, so I felt ashamed of being a black person. I felt ashamed of making money. I felt ashamed of being successful, sort of like maybe somehow I was selling out. I don't know. I was fake. It doesn't make any sense, now that I look back at it, but your course opened my eyes to help me understand that if I don't earn an income, I can't give my daughter the best in life. I can't ... Gosh, I'm going to cry. I am so sorry. Sam Ovens:	It's all right. Christi Johnson:	I can't give myself the best in life. I limit my own options, and so it's a fight for me on a daily basis, but I have to look at the person that I am becoming more than the person that I have believed I am, and day by day, I'm stronger, I'm better, I'm more confident. Your course has been life-changing for me, honestly. Sam Ovens:	So you felt like there was some sort of guilt that comes associated with making money. Christi Johnson:	Absolutely, yeah. Sam Ovens:	I think everyone feels this when they start. Christi Johnson:	What is that? What is that? Sam Ovens:	Well, it's like all of the TV shows. On the Simpsons, you've got Mr. Burns, the evil rich guy. Christi Johnson:	Oh, yeah. Sam Ovens:	Then you've got Scrooge McDuck and all of these. Pretty much every movie is a rich evil person, and I don't know why it happens that way, but it's a pop culture thing that's been stereotyped like that. I had it too, and it's very hard to get rid of, but when you do, it's very freeing. Christi Johnson:	Yeah. I feel better every day. Sam Ovens:	We understand the old you. Then explain back when you were the old you, what was this new you? What did that look like when you were back then? Christi Johnson:	What did the new me look like back then? Sam Ovens:	Well, you said you wanted to become the new you. Christi Johnson:	Yeah. Sam Ovens:	What did this new you want to be? Christi Johnson:	The new me wanted to be somebody who could reach out to business owners who I know need a good copywriter, and who are also making enough money to hire me and keep me retained. I wanted to be able to reach out to them and tell them exactly what I could see about their business that wasn't working right, not as a criticism, but just a value add to them, and to say, "Hey, here's where you could be. Here's what you could be doing, and you could turn your business around. You can basically productize your offering in a much better way, so that the user experience is better and people are more likely to spend money with you, because you just come across in a better way." I didn't do that before. The new me can call a business owner and confidently talk to them about what they're not doing to be as financially successful. The new me could go and create a marketing plan for someone based on stuff that I've done with my primary client. The stuff just works. There are just some marketing techniques that work, period. The new me was waking up early. I hate waking up early. I'm still definitely a night owl, but the new me was [crosstalk 00:12:46] Sam Ovens:	Then why wake up early, if you don't like doing it? Christi Johnson:	Because the rest of the world is up now. It kind of makes sense to be up when the world is up, instead of still resting. I was missing so much productivity in my day, and telling myself this lie that it didn't matter. Yes, it does. It matters. If I want to be a night owl once a week, kind of like people cheat on their diets, they eat well for 7 days or 9 days, and then they cheat one day a week, I can do that maybe on Saturday night, but I should not do that during the work week when business owners are running their businesses. I need to be available at the same hours they are, so that we can meet and talk, and I can grow my business. Common sense. I don't know. Where was I? The new me eats a lot more healthily. I love pasta, so yeah. The old me ate whatever she wanted to, because life is short. I don't know. I feel like I've just turned into a new person since October. I really have. Yeah. Sam Ovens:	Cool. What really helped you do that? Because that is a big thing to do, you know? Christi Johnson:	Yeah. I go through week two pretty often. Sometimes I play it in the background. I don't know if you've read The Science of Getting Rich by Wallace Wattles, but that's one of my favorite books of all time, and I've started listening to that as well. I don't know. I don't act like I used to. Sam Ovens:	What's an example? Christi Johnson:	Of not acting the way that I used to? Sam Ovens:	Yeah. Christi Johnson:	The stuff that I said. I eat better, I wake up in the morning on time, I can speak to clients with confidence. I can also talk to people about copywriting in a way that I kind of felt ashamed of doing before. I made my first post on Facebook. You mention in the training that we should clean up our Facebook walls, and my mind is pretty eclectic, as a writer and as a creative person, so I was really not interested in doing that, because I thought, "Okay, people are going to miss a lot of my personality, and I need them to know I think about a whole lot of stuff, because it's kind of important as a writer." But it can be distracting if you're trying to attract clients to you. One really good example of something that I do differently now is trying to post on my Facebook wall more stuff about copywriting and about business, but not in an annoying way. Yeah, just reigning my brain in and my activities, and making sure that those things are in alignment, I think is huge for me. Sam Ovens:	What part about week two was it that really had the most impact? What part of it shocked you? Christi Johnson:	How negatively I thought. I'll say too that part of my negative mindset was also because of my previous marriage. That marriage did not help me think well about myself at all, and so I've been trying to strip away parts of that for about five years now, and it's been the hardest thing in the world. I have been shocked at how poorly I think of myself, how I have, in the past, not believed in my own abilities to change my life. Your training ... How can I say it? I said it's life-changing, so that's a term I've already used. I said it's been transformational. I don't really know other words to use. These are big words to be using just for an online course. I've always thought badly of myself, but I just don't now. That's, I think, the most shocking thing. It's abusive to think as poorly about yourself as I have. I don't know. I can't do that, and you also cannot grow as a human being, thinking the way that I did. You just can't. Sam Ovens:	Got it. We've talked about, you were able to transform yourself, grow into this new self, more confident and everything. Christi Johnson:	Yeah. Sam Ovens:	Let's talk about now, how has that transferred into business? In your copywriting business, when we were chatting before, you said that you had lost a client and you were able to go out and get another one. Christi Johnson:	Yeah. Sam Ovens:	Tell us how you actually went about that. How did you go and get that client? Christi Johnson:	All right. I had been referred to a lady to write her a sales funnel for a new product launch last summer, and working with her was amazing. It was a one-time deal. I haven't talked to her since July, August of last year. At the end of August, I was referred to somebody who needed a retained copywriter. She had a health supplement product, and it was great, and she only needed part-time work. I worked with her, and then out of the blue, about a week and a half ago, she emailed me, and she was like, "Hey, I don't have any more work for you, and I'm not going to be paying you your March check." I was trying to figure out, "Well, now, what did I do wrong?" I can't see anything that I did wrong for her. She said that her stuff was making money. I don't know. She said she had a business downturn, but she didn't really explain what that meant. There could have been some personality issues that she didn't make me aware of. I don't know, but anyway, I lost that client, and so I stressed out for about 45 minutes straight, a full-on panic attack, because there's just so much about my life that I cannot afford if I don't have that extra client, and I was trying to figure out if I was going to have to bring my daughter home from New York. It was looking pretty bad for me. I sat on it for about a total of an hour, and I said, "You know what? I think I can call this previous client." But I hadn't reached out to her. We hadn't stayed in touch via email. We had no kind of relationship outside of that project, but I said, "I'm going to just try, because I think she does kind of what my primary client does, and we'll just see." So I texted her. I asked her what she was up to. She was at a marketing convention, Traffic & Conversions, I think, in San Diego, and she asked me if we could talk when she got back.We talked that Monday, and she was like, "What's up?" I went right into the pitch, and I asked her about her business, and I asked her how her income flow, cash flow was. I asked her about current projects that she had. I definitely tailored your script to me and my business, and then I painted a picture for her of where she is right now versus where she could be, and I did that based on what I did for my primary client. I was like, "Basically, based on what you're saying to me, it seems like you're stuck at around 40 grand a month, 50 grand a month. I could help your business get to six figures a month, and we could probably do it in the next 30 to 60 days." She said, "Really?" I said, "Oh, yeah." Then I named some things that I had been thinking about for her, and she was like, "Let's get it done." I was like, "What?" I had to put the phone down. [inaudible 00:20:50] I cannot believe I did that. The call took less than 30 minutes. She is so excited, and we've only been working together for a little over a week now, and I've already written her a webinar and all of her webinar registration process and all that good stuff. Quick tip, when you're doing copywriting, don't type anything. I speak all my stuff, and then I go back and edit it, so it makes it super duper fast. Yeah, I've added a lot of value to her life, and she's already got two more projects for me. I don't know. I lost the ability to earn six figures, and then took it right back to where I was in one week flat. Never done that. Never knew I could do that. Mind blown. Then I've got another client that I'm about to onboard. I'll be doing that later today, same script, same process. I'm like, "Oh my gosh, I'm going to have to hire copywriters for myself." Sam Ovens:	That'll be your next problem. Christi Johnson:	Yeah. I think that'll be a good problem to have. Sam Ovens:	It sounds like you were really able to see the bigger picture. Christi Johnson:	Yeah. Sam Ovens:	Instead of being so zoomed in on just the words you type, you see yourself as someone that can influence the entire business. Christi Johnson:	Yeah, I am actually a consultant. I'm actually a consultant, and I thought I was just a copywriter. I was not valuing my skill set. I was not taking everything I know and applying it to a whole business. I was just a service provider before. I'm a business owner and a consultant. Sam Ovens:	Cool. Yeah, because that's what I find is the big issue, is even with accountants, if they just look at the numbers and they don't understand the big picture of what those numbers mean and all of that, they make horrible accountants. Christi Johnson:	Yeah. Sam Ovens:	The same with every profession, really. Everyone really is a consultant, because that's mastering your craft, whatever that is, and then also seeing how that affects the big picture. It seems like you were able to completely do that, which is the main point of the course, so I'm glad to hear that. Christi Johnson:	Yeah. Sam Ovens:	Now, what's your plan now? You've got two clients now, right? Christi Johnson:	Yes. Sam Ovens:	How many do you think you can handle? Christi Johnson:	This third one is going to be a stop, a full stop for me. It's going to be another part-time client, and I'm probably going to outsource some of their stuff to copywriters that I've trained in the past. My next challenge is to figure out exactly how I'm going to scale the business, because I can't go further as one person, doing what I'm doing right now. I've got two things on my mind. I either want to teach people how to become copywriters, and you can be a copywriter without clients, but you have to have a product, or you have to have an affiliate product that you're marketing that provides you enough income. You can do it client-free, or you can go out and get clients like I have. It just depends on what your goal is out the gate. My goal out the gate was to have a stable income. I didn't even think about scaling. It didn't even occur to me that I could scale anything. Sam Ovens:	Cool. Yeah, it seems like ... I always think client work is sometimes the best way to learn. Christi Johnson:	Oh, yeah. Sam Ovens:	That's why I always recommend [inaudible 00:24:47] first, do the work for clients first, and then you'll be able to put ... Now you're starting to see how you can make the program. You know what I mean? Christi Johnson:	Absolutely. Yeah. Sam Ovens:	Yeah, because you've done it. You know exactly how to do it. Christi Johnson:	Yeah, and I don't feel like I'm a newbie or even intermediate. I feel like I have mastery over what I do. Sam Ovens:	Cool. Why don't you tell us how you got started with copywriting in the first place? There's a billion different things to do in the world. Why copywriting? Christi Johnson:	I was an English Literature major in college. I really just wanted to go to college to meet a man and get married. Family is my jam, okay? I didn't really have any kind of professional aspirations. I was a creative person, and I am a nurturer, so I said, "The only thing for me to do in life is to write for a living." I was going to write my novels or something at night when babies were in bed. I don't know what I was thinking about, but I've always wanted to write. I graduated from college, and my dad told me that the world has enough creative people, so I needed to be a doctor, or a lawyer, or some kind of a scientist, and all of those were ... Yuck, I don't like those. I know that they're important in the world. My father's a physician. My sister's a dentist. You need those kinds of professionals. It's just, that was not my bent. Grew up, had my daughter, got married, ended up going through a divorce, and it was during the divorce that I realized life is really, really short, and I need to do something that I love, so I tried to figure out how to write. I thought the only thing I could do was write novels or blog, and I just happened upon this course online, American Writers and Artists. I don't know if it's okay for me to mention that on here. Sam Ovens:	It's fine. Christi Johnson:	Okay. Yeah, American Writers and Artists, and they had a six figure course. It's probably a six-month long course. I did not sleep. I took that course day and night. In five weeks, I finished it. I had my first client in three weeks. I was hungry, and then I transitioned into their top tier training course. I went to their job fair boot camp, and I would say by the end of the first year, I did 29,000 dollars, which is not a lot, but it is a lot when you're making zero. Then my second year, I did around 70-something. Sam Ovens:	You know, you made more in your first year than I did in my first year. Christi Johnson:	Oh, really? What did you make? Sam Ovens:	I made nothing. Christi Johnson:	Oh, nice. Congratulations. Yeah, I had a child to feed, and I was ... I had a child to feed, so I had some different motivations. I was begging people to write. I was desperate. I took everything. I wrote for an air conditioning company, I wrote for a golf country club, I wrote for an attorney, I wrote for a bunch of [crosstalk 00:27:58] Sam Ovens:	How did you get those clients? Christi Johnson:	I found them on Facebook in groups of people who were looking for copywriters, but I have to say, me and marketing, we're not good friends. I don't like reaching out to people solo. You cannot tell I'm an introvert, but I am an introvert. I'm INFJ, and we come across as extroverts, because we're very well-trained and we like people, but it was exhausting. I mean, just interviewing or talking to a stranger, I'd have to get in bed for the rest of the day. It was really, really hard. Oh, and that takes me back to another thing about your training. Even though I am an introvert, I've been rewriting that story in my brain too, and I still feel physical fatigue or exhaustion when I'm interacting with a stranger, but I'm learning to balance that with other things, so that I get reenergized very quickly. Definitely, I'm stimulated by quiet time and alone time, but I'm learning how to become somebody different, if that makes any sense. Anyway, yeah, took that course, kept getting referred to people. I made some pretty nice connections in the industry with email copywriters. Ben Settle is incredible, and he actually referred me to the client that I still have to this day. My first retainer, I cried like a baby. I could not believe that that was my life, and I prefer being retained to always having a new client every single month, mainly because you get to know the client very intimately. You get to understand their business processes, but you do have to know how to build trust with people, and so I think that's a lot of the reason why a lot of copywriters maybe don't get retained, because they're so accustomed to that one-off, and they're maybe looking for the bigger and bigger check, instead of providing longterm value. Yeah, I got into copywriting because of a divorce. I was hungry and homeless, literally. Had to live with a lady in my church for a year, because we did not have a house to live in. Copywriting, it really did save my life. Sam Ovens:	It sounds like you're pretty passionate about it too, because it was writing. How important do you think being passionate about your thing is to people? Christi Johnson:	I'm biased. I think it's very important. I know people who say that it's not as important, if you like it well enough, you can do anything, but I live, eat, and sleep writing. I write more than I do anything else in the world. I love it. There's a huge difference between the word friend and confidant. I'm very funny about words. Use the right word in the right setting. I purposely trigger people sometimes just using words, just so I can make sure that what I think is supposed to go on a page actually should, or what I think should go in a video script should. It's powerful. The use of words, it's powerful. Shoot, I'd say going through your training course, some of that is like a sales letter. I don't know if you look at it that way, but some of your training is just ... You take us through the whole range of emotions, just getting us to the point where we can get the work done. It's like you tear us down and build us right back up again. I love that. Sam Ovens:	Thanks. Christi Johnson:	Yeah. Sam Ovens:	Cool. Any parts do you think we missed in that transformation and your experience with the program so far? Christi Johnson:	Nope, not in the transformation part. I haven't gotten into Facebook ads yet, so I have no idea, but I've heard that that is exceptional too, but no. If you could sell, and if you can think right about yourself, I think you could do pretty much anything, and know how to choose your niche too. I considered very briefly not doing anything related to copywriting, and that was the most miserable time. I don't know what I was thinking about, but yeah, niche selection, mindset, and then selling. This course is ... I think the course is worth 5,000 dollars, no hesitation. It's totally worth it, but I'm glad that you have it priced in such a way that regular people can afford it. Sam Ovens:	Cool. What would you give as advice for other members of Consulting Accelerated? Some people that might not have their niche selected, some people who might think, "I'm in the wrong niche," or they haven't got their first client, or they're paralyzed with fear and the mindset stuff, what would your advice be to them? Christi Johnson:	Niche selection. I would say the first thing to do is make sure you go through the mindset course. That was a game changer for me. After that, choosing your niche shouldn't be so difficult, because you will be closer to the person that you're trying to become. That part of the course helps you to strip away the fear of going after what you love. My strongest recommendation is if you're still struggling with what niche to go into, you probably are struggling with your mindset too. You might not really believe in yourself, so I'd say go through that. I go through that course, that section of the course over and over again. I think I've done it four times now, maybe, and I'm about to go back through it. It's worth it. It's just worth it, so my recommendation is to do the work. Whatever Sam says do in the course, do it. Do it in order, don't skip ahead. It all builds on itself, and it works, period. Also, if you're struggling at feeling like your niche is too small or there are too many people in it, like, "There are a whole lot of people in health and fitness. There are a whole lot of personal trainers out there." So what? There are a whole lot of overweight people out there. There are a whole lot of people who want to transform their bodies. There's no such thing as saturation, and when you're great at what you do, you can get clients, period, when you're great and when you're passionate about it. [crosstalk 00:34:38] Do the course, y'all. Do it. Just do it. Sam Ovens:	Cool. Well, anything else you want to share, or do you think we've pretty much covered the full story? Christi Johnson:	No, I just want to say that even though I just heard of Consulting, I heard of you a long time ago. I've been following you since an amazing Mixergy interview, since you were at The Foundation with Dane Maxwell. You are a blessing in the industry. I cannot tell you how much money I've spent on courses, and yours is the first course that delivers all the way around. You don't skip out on the technology, you don't skimp out on sales, mindset. There's nothing you leave out, and I can't imagine how you would improve upon it. I'm sure that you're thinking of ways, but thank you for what you've created. You're a blessing to people, to human beings all across the planet, period. Sam Ovens:	Thank you. Well, thanks a lot for speaking with me today, and sharing your story and your experience, and everything. I'm sure it's going to help a lot of other people, and I'm sure it's probably going to inspire some people to look at copywriting too. Christi Johnson:	Uh-oh. Sam Ovens:	Well, it might be good. They might be able to learn from you. Christi Johnson:	Uh-oh. Thank you. Sam Ovens:	Thanks a lot. See you later. Christi Johnson:	Okay, bye. Sam Ovens:	All right.